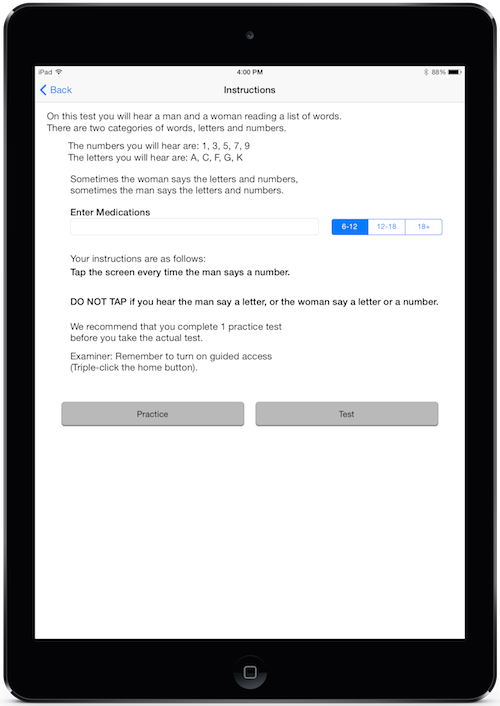 The Auditory Concentration Test App (TACT) is a great example of one of our apps that truly improves the quality of life for the user. Designed by Declan Quinn, Mb., FRCPC, a Child and Adolescent Psychiatrist, the Auditory Concentration Test is a continuous performance test used to measure sustained attention in Attention Deficit Hyperactivity Disorders. The test is designed to show patients and families the responses to the use of a stimulant medication in ADHD (however it is not diagnostic for ADHD). The TACT is a continuous performance test designed to measure errors of commission, errors of omission and variability of scoring over a 15 minute time span. A total score is given with the number of accurate responses (omissions) and mistakes (commissions) as well as a score minute by minute. It can be used to demonstrate clinical response to stimulant medication for patients and families. It is not a diagnostic test for ADHD. It demonstrates clinical improvement 90 minutes from baseline after medication has been taken. It should be administered by a physician or a specifically trained healthcare professional such as a nurse or psychologist in association with a physician. It can be considered part of the assessment and treatment of ADHD and the response to medication. It does not replace a comprehensive clinical assessment and evaluation. It can be used for research purposes.